TheFIRST ISSUE of the Very First Punisher Ongoing Series! FIRST WOLVERINE APPEARANCE AS PATCH & FIRST ONGOING SERIES. WOLVERINE 1 CGC 9.2. WHITE PAGES. ————————///////\\\\\\\————————-. Punisher: The Ghosts of Innocents Book 2. 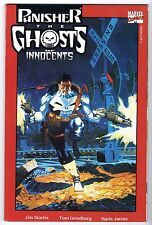 This 1993 issue of Marvel Comics,Punisher: The Ghosts of Innocents Book 2is in Near Mint Minus Condition! A very Nice Comic! ( GRADE ) NM- CON DITIO N 9.2, NICE COPPER AGE BOOK, WHITE/OFF WHITE, CLOSER TO WHITE PAGES, KEY ISSUE. Punisher #4 of 5. April 1986. Marvel Comics. Punisher Limited Series. The Punisher #1 (2nd Series) Marvel Comic Book! 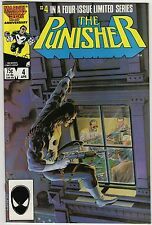 The Punisher - Limited 2nd Series - 1st Issue in Near Mint Condition! Also The Punisher card as seen in photo MVC. 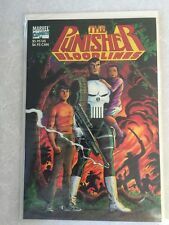 5 out of 5 stars - The Punisher #1 (2nd Series) Marvel Comic Book! 14 product ratings14 product ratings - The Punisher #1 (2nd Series) Marvel Comic Book! There is a certain degree of variation between each person’s interpretation of the grades but I have done my best to give a grade that most people would consider accurate. The more you buy the more the savings really start adding up. ( GRADE) N M- CONDITION 9.2/9.4, NEW UNREAD. NICE VARIANT COVER, SIGNED BY MARK BROOKS. Punisher #2 Limited Series - CBCS 9.2 - Marvel, 2/1986. THE PUNISHER: BLOODLINES. 1991 MARVEL NM. Up for sale is The Punisher #55 and it's in near mint- condition. I have graded this to the best of my ability using over 25 years of experience. However, I am not a professional grader and grading is subjective. Punisher #3 Limited Series - CBCS 9.2 - Marvel, 3/1986. The Punisher Limited Series - Hot Netflix! #2 1986 (Grade 9.2)WH. Multiple art pages can easily be combined because they are light and thin. For instance, two statues require a much bigger box. How do you grade?. This auction is for Punisher Wr Journal #29 Published by Marvel Comics 1991. CGC Graded 9.2 (New Case) Pics are of actual item you will receive, feel free to ask any questions. I will combine shipping on multiple items. Thank you. Punisher Armory #2 NM- 9.2 Marvel Comics,Jim Lee Cover; $4 Flat-Rate Shipping! Up for sale is The Punisher Armory #2 and it's in near mint- condition. I have graded this to the best of my ability using over 25 years of experience. However, I am not a professional grader and grading is subjective. Punisher 1 CGC 9.2 (1987) Classic and Red Hot with new Netflix series! Just back from CGC, case is in perfect condition and still in plastic sleeve. CGC certification# 1240633014. Punisher #5 of 5. Marvel Comics. Punisher Limited Series. PUNISHER #50, 9.2 NM-. PUBLISHER: Marvel Comics. Acceptable minor defects on a NM copy include: A very small amount of spine stresses without color breaks, very minor instances of denting (two or three at most), slight corner blunting, and minor (less than 1/8") bends without color breaks. The sealed case also ensures the integrity of the grade assigned by the third party Grader, and ensures that no one replaces the book with a different, inferior copy. When removed, the value is diminished as the grade assigned is no longer certified and it will require re-submission to the third party Grader for total re-grading. COSMIC ODYSSEY #1, 2, 3 and 4 from DC Comics 1988. These four DC books are in prestige format and represent the complete mini-series. Features Batman and Superman in amazing stories by Jim Starlin and cover and inside art by Mike Mignola. Punisher War Jounral (1988) #8 NM- 9.2 Marvel,Jim Lee; $4 Flat-Rate Shipping! Up for sale is The Punisher War Jounral #8 and it's in near mint- condition. I have graded this to the best of my ability using over 25 years of experience. However, I am not a professional grader and grading is subjective. Punisher War Journal (1988) #41 NM- 9.2 Marvel Comics;$4 Flat-Rate Shipping! I have graded this to the best of my ability using over 25 years of experience. However, I am not a professional grader and grading is subjective. All comics arrive bagged and boarded. Punisher War Journal (1988) #28 NM- 9.2 Marvel Comics;$4 Flat-Rate Shipping! Punisher War Journal (1988) #19 NM- 9.2 Marvel,Jim Lee;$4 Flat-Rate Shipping! I have graded this to the best of my ability using over 25 years of experience. However, I am not a professional grader and grading is subjective. Punisher #1 - 9.2 NM - 1st Issue! - Marvel (1987) - Newsstand! - HIGH GRADE! Punisher #1 - NM- 9.2 - Newsstand! 1st issue of regular series! Great book, and a newsstand version to boot! Punisher has always been popular, but since coming back in the Netflix hit Daredevil, we can't get enough! I have graded this to the best of my ability using the comic book grading scale attached below. However, I am not a professional grader and grading is subjective. All comics arrive bagged and boarded. Punisher #2. Unlimited Series. August 1987. Marvel Comics. PUNISHER #53, 9.2 NM-. PUBLISHER: Marvel Comics. 1991, Kingpin appearance. Acceptable minor defects on a NM copy include: A very small amount of spine stresses without color breaks, very minor instances of denting (two or three at most), slight corner blunting, and minor (less than 1/8") bends without color breaks. PUNISHER Annual #3, 9.2 NM-. PUBLISHER: Marvel Comics. 1990,Mike Baron stories, Mark Texeira & Dwayne Turner art. Acceptable minor defects on a NM copy include: A very small amount of spine stresses without color breaks, very minor instances of denting (two or three at most), slight corner blunting, and minor (less than 1/8") bends without color breaks. The Punisher #8 (May 1988, Marvel) Vol #11 NM-. Bag/Board. Punisher (1987) #2 NM- 9.2 Marvel Comics,Frank Castle; $4 Flat-Rate Shipping! Up for sale is The Punisher #2 and it's in near mint- condition. I have graded this to the best of my ability using over 25 years of experience. However, I am not a professional grader and grading is subjective. PUNISHER Annual #2, 9.2 NM-. 1989,Atlantis Attacks crossover; Moon Knight appearance. PUBLISHER: Marvel Comics. Acceptable minor defects on a NM copy include: A very small amount of spine stresses without color breaks, very minor instances of denting (two or three at most), slight corner blunting, and minor (less than 1/8") bends without color breaks. THE PUNISHER #21 CBCS 9.2 2X SIGNED MIKE BARON & ERIK LARSEN! Punisher #1 (Marvel)(1987) in near mint minus 9.2 condition. Almost perfect complete copy with no missing pages and nothing clipped out. All staples attached to cover and centerfold. No restorations.